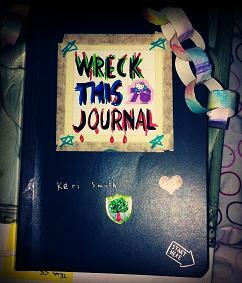 Wreck This Journal. | An alien voice under a duvet of dreams. Posted by phoenixaeon in Art, Creativity, WTJ. 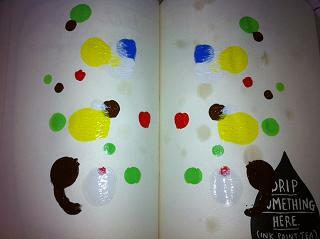 Just before Christmas I came across this book, Wreck This Journal, that looked quite interesting. I had a look through some of the pages on Amazon’s look inside feature and decided that this might be a fun thing for Princi and I to do. So I bought one for me and one for Princi as a Christmas pressie. And I’m glad I did. We spent a lovely couple of hours looking through all the instructions and choosing things to do. For those new to WTJ, the idea of the book is this: to open it up at whatever page and do what it says on the page. It could be filling the page with circles, or making a paper chain, or even eating colourful sweets and then licking the page. It’s supposed to help you unlock your reckless abandon, which if you’re like me has been hidden away somewhere deep and unfathomable for years, and open you up to more creativity. It also gives you permission to damage a book – something I’ll do here, but it’ll not encourage me in any way to deface regular books! Nah-ah. I just can’t bring myself to do that. Beginning the defacing of the cover. 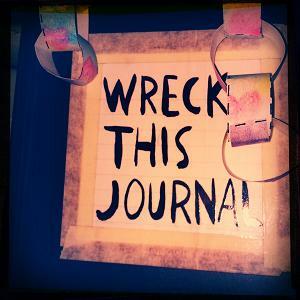 So here are a few more photos of my day of destruction with the journal. Make a paper chain. I coloured the paper with water-soluble crayons first, then smuged the crayon by licking my fingers! 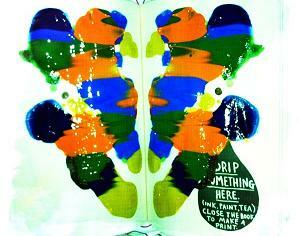 The first ink/paint blot print. Yep. I was disappointed with this, so when it was dry, I did it again. The second ink/paint blot print. I was much happier with this one. 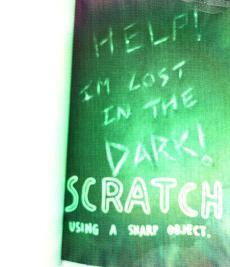 Scratch with a sharp object. I used the sharp end of an interdental stick. The photo is a little out of focus as it was taken in near darkness. And there we have it. I will do some more tomorrow, and I’ll update the blog as I go. And if you want to see Princi’s efforts, go here.